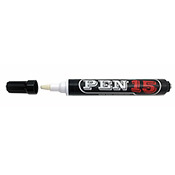 Cool marker, but I made mine with a 'tide to go' pen and a sharpie king size nib. It's the same body and u can also get a tide mini such is nice too...(apreply) not the same. The ink in this is special.